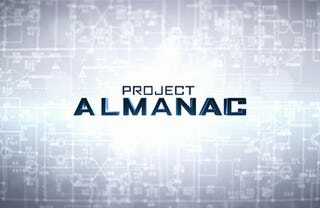 Project Almanac is shot found-footage style, had its title changed three times and had its release date pushed back nearly a year, but don't jump to conclusions just yet. We got the chance to see Dean Israelite's directorial debut at Comic-Con, and while we can't give a full review just yet, we can tell you it looks great so far. Jonny Weston leads as David, a wannabe MIT student whose father passed when he was just seven years old. While poking around some of his dad's old things, he comes across the plans for a time machine. Eager to finish what his dad started, David recruits his two best friends, Adam and Quinn (Allen Evangelista and Sam Lerner), to get the thing running and his sister, Christina (Virginia Gardner), to film the whole process. Project Almanac's got a number of very solid components to it, but the standouts are the tech details and the performances. It isn't easy selling a time travel narrative, but the writers, Israelite, and Weston and Evangelista pull it off well. First off, scribes Jason Pagan and Andrew Stark absolutely pack the script with highly specific time travel information. I probably only understood about 50% of it, but that's where Weston and Evangelista came in. It didn't matter if I understood it all because I believed that they did. And then we've got Israelite who's busy covering just the right stuff. Watching a group of kids go back in time should look ridiculous, but Israelite strings together a selection of shots that gives the process a sci-fi thrill, but also keeps it grounded enough to feel real. And then right along with Weston and Evangelista, we've got solid work from Lerner, Gardner and Sofia Black-D'Elia, who plays David's crush. Every movie needs strong performances, but a found footage movie in particular will fall completely flat without it, especially one about something as outrageous as time travel. All five main players do have some familiar character tropes, but they're blended with some more unique traits, suggesting these characters wouldn't have been the same played by anyone else. Plus, they're likable. These are five nice, normal high school students who have goals you can get behind, and they're fun, too (Lerner) in particular. Project Almanac is a thriller more than anything, but laughs aren't hard to come by. We've still got months to go until the film's January 30th, 2015 debut, so we'll leave it at that, but at that point you'll have no excuse. This is some serious advance warning; Project Almanac is worth looking out for.